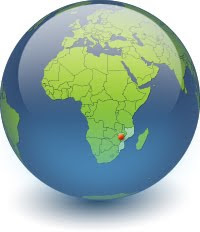 This morning, we bid farewell to Malawi and crossed into Portuguese-speaking Mozambique. Every other overland tour company sends their trucks through Zambia due to the economic and political turmoil in Zimbabwe – Oasis is the only company that visits Zimbabwe, and to get there we have to cross the Tete Corridor in the northern arm of Mozambique that juts up to the west of Malawi. During Mozambique's civil war, this stretch of road was infamously known as the Gun Run and was plagued by hijackings and land mines. The landscape is vast and beautiful – rolling hills receding into mountainous backdrops are punctuated by traditional villages of thatched-roof huts. The villages seem more basic and rural than those in other countries we have visited. There are no brightly colored ads for telecom companies painted on every shop, but as a result the earthen colors blend picturesquely and naturally into the countryside. The residents of these villages live simple lives centered around farming, and I can't imagine that it looked much different here hundreds of years ago. After a quick lunch on the side of the road, where we endured the curious gazes of a growing crowd of locals, we drove on towards Tete, the capital city of Tete Province. Tete is nestled on the banks of the mighty Zambezi River, and we had to wait for an hour in traffic before we could cross the main bridge. A mob of vendors ran towards our truck while we were stopped, reaching up to sell cold soft drinks. They would accept almost any currency, which was helpful since most of us still had some Malawian kwacha left. It is technically illegal to take kwacha in or out of Malawi, and there are no money changing facilities at the border crossings. It became a gamble when taking money out of ATMs in Malawi. Too little, and you wouldn't be able to buy meals or pay for activities. Too much, and you would be stuck with useless currency after leaving Malawi. Luckily I had 200 kwacha left, just enough for a refreshing Coke. After crossing the incredibly wide Zambezi, we drove another hour and a half to our bush camp. There were flies everywhere – at any one time, I had ten to fifteen of the annoying insects resting on my body, and many more buzzing through the air all around me. We quickly built a fire to drive them away, but they didn't seem to diminish much – I just took refuge in my tent until dinner. The flies finally dispersed after sunset, but there is not much to do at bush camps, so we all retired early to our tents.